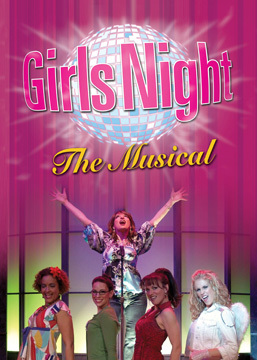 In "Girls Night: The Musical"
Stoneham Theatre will present "Girls Night: The Musical" from June 2 - 9. Written by Louise Roche, the production is directed by Jack Randle. This feel-good musical comedy follows five friends in their 30s and 40s during a wild and outrageous Girls Night Out at a karaoke bar. Friends since their teens, these ladies have all had their fair share of heartache and tragedy, joy and success. Among the characters are Carol the party girl, blunt Anita who tells it like it is, Liza with her marital (and eating) issues, boring Kate the designated driver, and Sharon, the not-so-angelic angel who just couldn’t resist tagging along. "Girls Night: The Musical " has earned rave reviews playing packed to houses throughout the United Kingdom since 2003. It premiered in the United States in May 2007 and has toured extensively across the country since then. British playwright, author and television producer, Louise Roche has written and produced six other plays including "Girls Night" (UK Tours 2003, ‘04,’06), "Bobby and Johnny" (UK Tour 2005), "Girls Behind" (UK Tour 2005), "Checkout Girls" (2005), "Lucky Balls" (2002), and "Milton Keynes The Musical" (2002). Her novel Glutton for Punishment is available in paperback. Director Jack Randle, who's married to Louise Roche, studied Drama at Exeter University. A veteran British actor, he has starred in both theater and on television. His stage directing credits include "Girls Night," "Bobby and Johnny," "Girls Behind," "Lucky Balls" and "Frankie’s Game." For tickets and information, stop by the box office, call 781-279-2200 or visit www.stonehamtheatre.org.